The full official site is live at ultra-healthy 66 East 11th Street, the world’s first “WELL Certified” residences. The elaborate terra-cotta facade Greenwich Village building, which dates back to 1897, was converted by Delos Living into five wholesome apartments. Listings at the former dress factory first appeared in September. Pricing for available units starts at $15.5 million for a three-bedroom measuring 3,663 square feet, according to the official site. 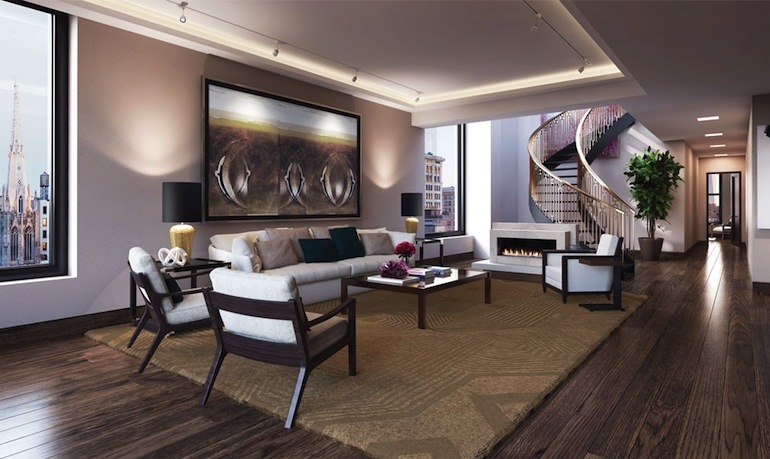 Also on the market is a $45 million four-level townhouse and a $50 million duplex penthouse. LB Architects designed the building; Los Angeles-based SFA Design did the restorative interiors. The residences have keyed elevator entry, ceilings up to 15 feet, “posture-supportive” oak flooring, in-duct aromatherapy, vitamin C-infused showers, master bedroom suites with walk-in closets and an individually programmed circadian lighting system that simulates dawn to stir you from your sweet slumber. 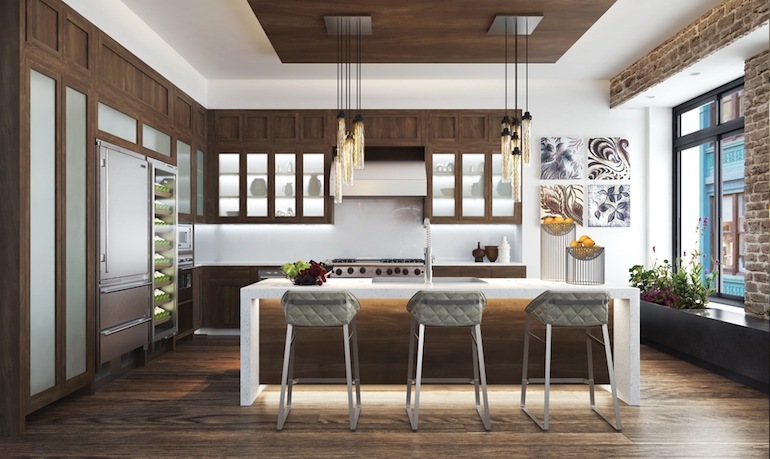 The kitchens have polished quartzite countertops, window box herbariums, enclosed juicing station in the island, 78-bottle wine refrigerator (for your health!) and appliances by Miele, Viking, Sub-Zero and Bosch. The onyx master baths feature Jacuzzi whirlpools, separate walk-in steam shower, double basin vanities, a Toto water closet with remote controlled bidet and honed limestone floors with radiant heating. But what about the penthouse, you might cry? Hush, little bird — the 7,693-square-foot temple to good living has a three-story metal staircase leading up to a solarium, surrounded by over 2,200 square feet of private rooftop terrace. The 35-foot-long living room has a double-height window, and the master bedroom suite comes with twin dressing closets, a windowed bath with Jacuzzi whirlpool with chromatherapy. 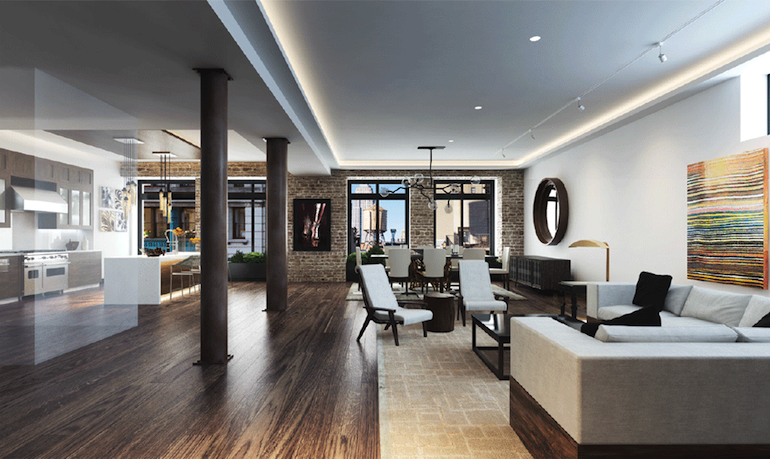 Amenities include a 24-hour doorman, private storage available for purchase and Donna Karan’s Urban Zen wellness concierge, which will “curate and coordinate your daily wellness experiences.” The development is pursuing LEED Silver Certification. Dolly Lenz Real Estate is marketing the property.